01 Neither Here Nor There - Just one week after Peter Bishop saved the day and was then wiped from existence, the truce between the two worlds remains intact and the two sides are forced to work together. Lincoln Lee joins the Fringe team as they investigate a shapeshifter case that is very personal to him. 02 One Night in October - As the victims of a highly intelligent serial killer "Over There" stack up, the Fringe Division "Over Here" is asked to assist. As the two sides tangle and innocent people remain at risk, the suspect's doppelganger "Over Here," a professor who teaches Forensic Psychology, is brought into the fold and forces the team to consider the notion of sending civilians to the other side. 03 Alone in the World - When two 12-year-old kids bully another boy, they are found dead and in just hours after dying their bodies are shockingly in an advanced state of decomposition. 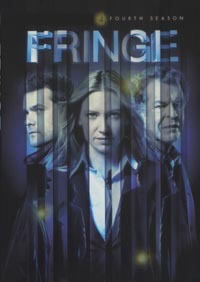 As the Fringe team investigates the mysterious case, they uncover an amorphous figure claiming more victims. Meanwhile, Walter becomes increasingly distracted by his hallucinations. 04 Subject 9 - Olivia uncovers a dangerous force that may be connected to Walter's past experiments with the drug Cortexiphan. Their investigation forces Walter to leave the lab for the first time in years as he and Olivia head to Massive Dynamic in New York to examine old case files. Walter struggles with life outside the lab as he comes face-to-face with the demons of his past. 05 Novation - In the aftermath of recent shocking events, things really escalate when the translucent shapeshifters return. As the threat and circumstances intensify, former Massive Dynamic scientist Malcolm Truss enters the fold. Meanwhile, Nina Sharp pays Walter a visit in the lab. 06 And Those We Left Behind - The Fringe team must find the pattern between tragic time loop anomalies. As the investigation unfolds, Raymond, an electrical engineer, and his wife Kate, a professor of theoretical physics, enter the picture. 08 Back to Where You've Never Been - In an effort to find a way home, Peter journeys to the Other Side to confront Walternate. His venture proves more dangerous than expected. Meanwhile, Olivia receives a dire premonition from an Observer.